SUGAR aims to address the problem of inefficient and ineffective management of urban freight distribution, a critical component of the overall urban transport system and a primary source of vehicle pollutant emissions. To accomplish this goal, the projects promotes the exchange, discussion and transfer of policy experience, knowledge and good practices through policy and planning levers in the field of urban freight management, between and among Good Practice and Transfer sites. space and territory: planning and development of distribution areas, loading areas, industrial zones, economic development zones, etc. These policy leverages, together with partnership building with logistics and transport operators, are the necessary ingredients to creating a tailored solution for more efficient urban freight transport management. The refinement of urban freight policies of SUGAR Good Practice Sites through dialogue with other leading administration outside the project partnership. These objectives will be supported through the mapping of new policy ‘innovation’ areas in city logistics, thematic training and specific technical round-table discussions. The development of urban freight policies in SUGAR Transfer Sites. 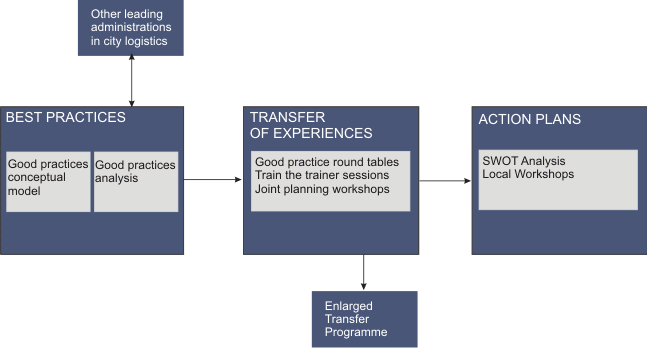 These objectives will be supported by the development of good practice analysis thematic training, joint planning for transfer sites, and the development of local transfer action plans. The creation of interest, knowledge, tools and exchange for new administrations from outside the SUGAR partnership through the Enlarged Transfer Programme. This objective will be met by providing access to project results, participation in training events, and a high level exchange programme for bilateral meetings between administrations.